Kazan University's partner in this research is the Arbuzov Institute of Organic and Physical Chemistry. The joint team proved that water-soluble polyol-methanofullerenes C60[C9H10O4(OH)4]6 and C60[C13H18O4(OH)4]6 can decrease mitochondrial transmembrane potential. This makes them promising in the creation of targeted mitochondrial medications and composites based on them. As the paper posits, there is currently no doubt that hyperpolarization of mitochondria and concomitant oxidative stress are associated with the development of serious pathologies, such as Parkinson's disease, Alzheimer's disease, autoimmune syndromes, some cancers, and other conditions. 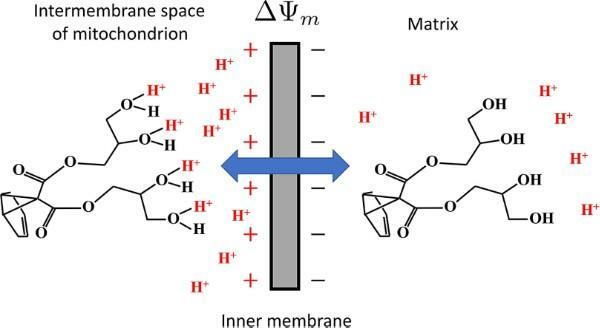 Hyperpolarized mitochondria have an elevated transmembrane potential because of the excess of H+ ions in the intermembrane space in comparison with the matrix (pH 8). Protonophores decrease the mitochondrial potential by facilitating electrogenic transport of protons through inner mitochondrial membrane. The most useful of them are soft protonophores which only remove the excess of the potential but don't decrease it below the necessary limit. Natalia Kalacheva et al. state that the researched methanofullerenoles can accept protons in acidic medium characteristic for intermembrane space of hyperpolarized mitochondria. Protonated molecules transfer protons into the mitochondrial matrix. As a consequence, the proton gradient is dissipated, which causes a decrease in mitochondrial transmembrane potential and reduction in ROS production. In the publication, the authors describe water-soluble polyol-methanofullerenes as soft protonophores because they can accept H+ ions only in hyperpolarized mitochondria and cannot penetrate normally polarized mitochondria. The research was based at the KFU Gene and Cell Technologies Lab and funded by Project 5-100.